Home Explore Optiv Insights Blog I Want the Cloud, But Where Do I Start? … It is a question many admins and technology professionals are starting to ask. Well, to be fair, as long as ‘The Cloud’ has been a buzzword, people have been asking, but in the last 12 months alone, I’ve had many customers ask it for the first time: how do we use the cloud; how can I integrate with the cloud; how can I move my datacenter into the cloud? And the cloud isn’t a single, monolithic mechanism you purchase a piece of. You have to know if you want Amazon EC2 or Microsoft Azure or VMware vCloud Air. You have to understand the terminology and technology. You have to know why you want it, and what you are going to do with it. And once you have all that under your belt, you have to then integrate it with your current, in-production environment. Not daunting at all, of course. The key is to know why you want to integrate with the cloud. Is it a disaster recovery option? Is this to handle spikes in resource use? Or is this a planned migration of your datacenter? Knowing what solution you are looking for will help you in selecting the best provider and then allow you to begin planning your integration. Do you want complete integration into your existing vSphere and vCenter infrastructure? If so, then you want to select an option that has an appropriate level of compatibility to VMware. Is this to extend your datacenter into Asia or Europe without requiring a physical colo? If so, then availability in specific regions or virtual machine build options may dictate your best choice. Defining your parameters as part of your initial discovery will help you avoid going down the wrong path. Noting these requirements and organizing them based on purpose and importance will help keep you on track. Look at where you are now, where you want to be in 6 to 12 months, as well as your long-term goals. Providers have their own feature set and not letting the minutia distract is important. vCloud Air, for example, may allow more virtual machine customization options, but if your goal is DR in a region they don’t support, you are getting distracted. Once you have defined your specific purpose and requirements, you can begin to compare features of the major players and some of the niche players. If all you need is a hosted webserver, then perhaps all you are looking for is a simpler option like Rackspace. 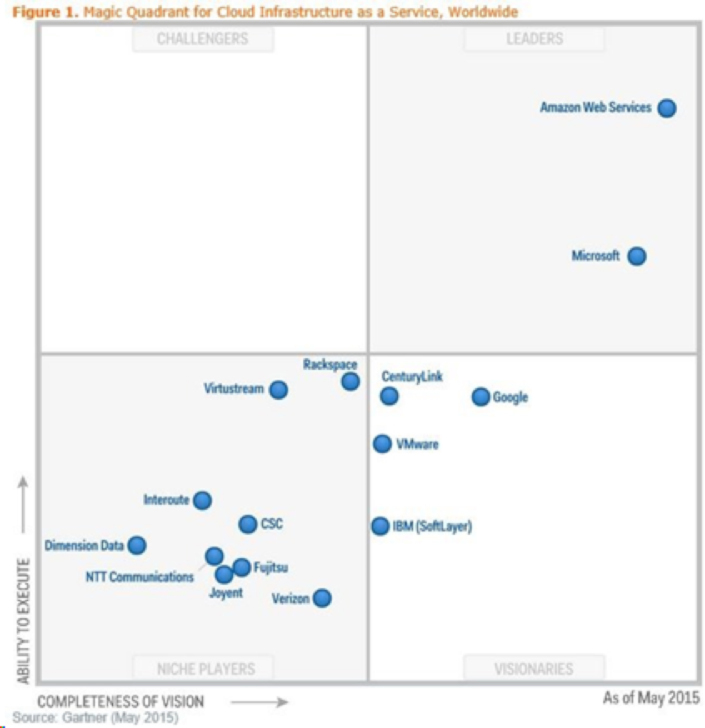 But if you are planning on expanding in a year, perhaps AWS is where you need to be. This is where your personal requirements document comes into play. AWS and Azure have fairly comparable features and are leading the field for cloud providers, so they may take you the most time to determine if there is a preference or a reason to go with one or the other. vCloud Air on the other hand is lagging behind both leaders by most accounts, but offers a compelling service for VMware shops looking for integration. Included below are links to the specific features of each service and a table with a quick overview for reference. Other software packages (SharePoint, Oracle and Citrix) may also affect what choices you make for your cloud platform. Many of our customers utilize Citrix XenApp or XenDesktop and want to extend into the cloud as part of their initiatives (datacenter expansion, high availability, regional servers and resources). While Citrix can be deployed as a standalone site within any of the cloud providers, XenApp and XenDesktop 7.5 and 7.6 natively integrate into AWS, which allows the administrator to use Machine Creation Services (MCS) to deploy servers and desktops within the cloud itself. Additionally, each service also has their own templates with predefined builds that make deployment easier, which may affect some of your choices depending how much time you have for your cloud project. Not having to build everything from scratch can save time, but may make it harder to bring along your own licensing depending on the vendor or product. While this is not comprehensive, it is meant to help you get momentum and avoid analysis paralysis. Getting your feet wet is the first step. Mistakes will be made, but the key is to make small mistakes while you are learning the platforms and testing out a dev or POC environment; not while in the middle of a full site migration.